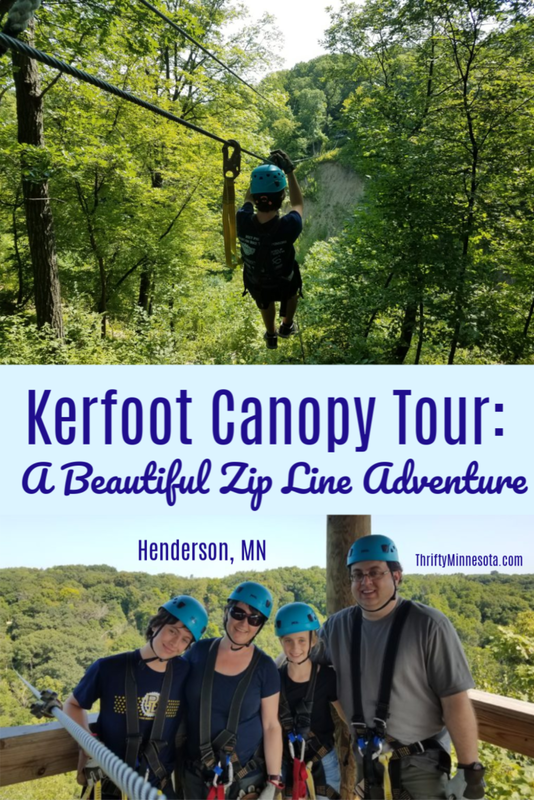 In the spirit of experiencing more fun in our own backyard and adding more experiences to our family’s zip line bucket list, last summer we decided to try out Kerfoot Canopy Tour, a really fun zip line adventure near Henderson, Minnesota, just 45 minutes from where we live. The experience did not disappoint, giving us thrills, variety and beautiful views! 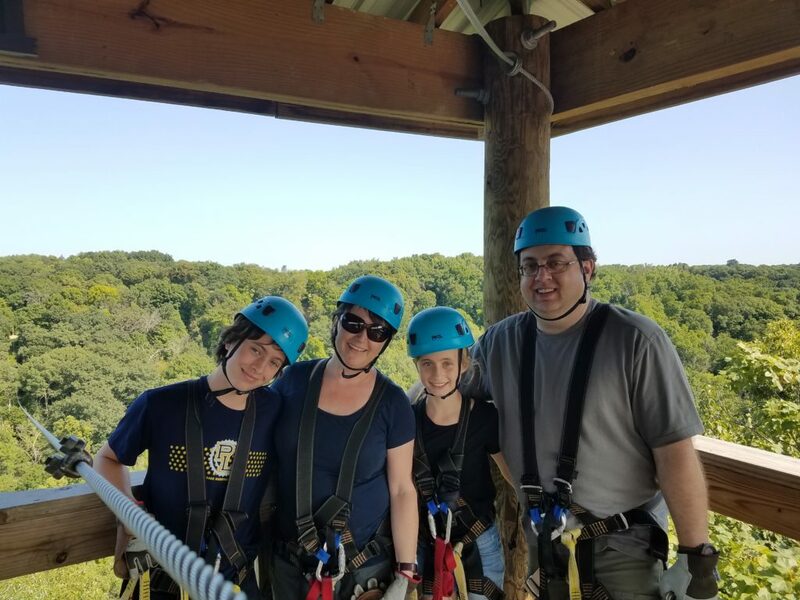 Thanks to Kerfoot Canopy Tour for complimentary admission for our family! All opinions are our own. 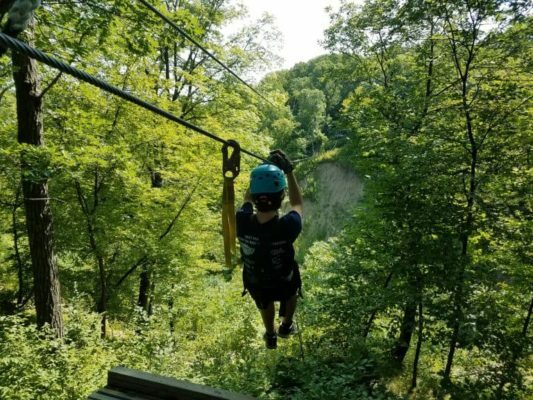 All current information about Kerfoot Canopy Tour zip lines can be found at Kerfoot Canopy Tour. As with most places like this, weekdays are quite a bit less expensive. If you can make it on a weekday, I would definitely recommend that. Kerfoot Canopy Tour is open year-round, so even those hard-core outdoorsy people who embrace the cold can zip in the frigid Minnesota winter! Kerfoot Canopy Tour offers 14 zip lines, many more lines than most zip line courses we have experienced. Several were pretty short, but two of them spanned over the river gorge and were quite long. The long lines had us riding well above the trees, providing beautiful views along with the rush of being so high. Many of the shorter lines toward the end of the course were steeper and really fast, which made them exciting. There was a fun suspension bridge along the way to take us across the gorge at one point. This tour was fully guided, so we had two staff along the whole time. I was very impressed with the professionalism of our young guides. One thing I really liked about this course is that all the lines were given a rating from 1 to 4, with 1 indicating a line that was beginner level (for the training lines and one of the early lines that was slower) to 4 being expert level (for a couple of the shorter, faster lines). So at each line you had a sense of what to expect for a thrill factor. This was our first time riding a zip line with hand braking, which meant that we wore gloves with an extra leather piece over the glove on your dominant hand. To stop, the guide on the far side of the line would signal when you should move the hand with the leather piece onto the line itself and press down to slow yourself. There was a rope on the end of the line that staff could use to stop us as a backup if needed. Here are some pictures from our adventure. View of the suspension bridge from the high tower. WAY above the treetops and over the river valley. This is a good course for both new and experienced zip liners. If you have gone zip lining before, you will find this course has enough scenic views and challenges to make it truly fun. The owners of Kerfoot Canopy Tour also own Brainerd Zip Line Tour in the Brainerd Lakes area of central Minnesota. We would love to try that one as well! We really enjoyed this highly professional, scenic experience. For us as experienced zip liners, the ability to hand brake actually gave us more of a feeling of being active in the zip line experience (versus just being hooked on and off and stopped by staff). We would definitely recommend this fun experience! Save 40% on the Kerfoot Canopy Tour or the Brainerd Zip Line Tour when you purchase and book your reservation by April 22nd! More details here. One of the best ways to enjoy spring is by heading to the farm, especially Gale Woods Farm in Minnetrista. Each Saturday from April 6th – May 25th (except April 20th) you can enjoy various farm activities, meet some baby animals and explore the barn. There’s a small admission fee of $5 per person. More information can be found on the Three Rivers Park District website. Don’t forget to dress for the weather, but also for being on the farm. No fancy clothes needed for this fun adventure! Outdoor fun on a real working farm. Located on picturesque Whaletail Lake in Minnetrista, Gale Woods Farm features a unique educational opportunity where visitors of all ages gain an understanding of agriculture, food production and land stewardship. Explore the barn, meet baby farm animals, play in the garden and participate in seasonal farm activities. Wear farm clothes and get ready to dig in and be active. Drop in anytime. Children under 2 free. Avoid the line and purchase your tickets ahead of time. Children 17 years and younger must be accompanied by an adult. 20% discount for groups of four or more. All tickets must be purchased at the same time to qualify for the discount. 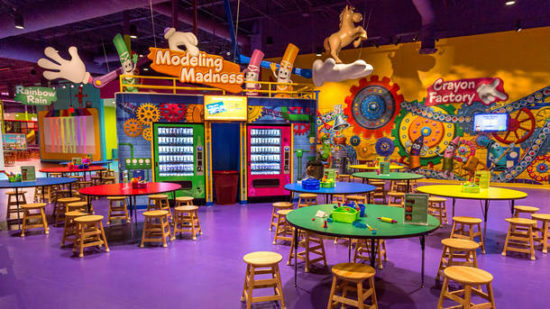 Crayola Experience is treating little ones to a day of fun by offering free admission on weekdays to all kids 4 and under, now through 4/30/19. Please note that you’ll need to present a copy of your child’s birth certificate. 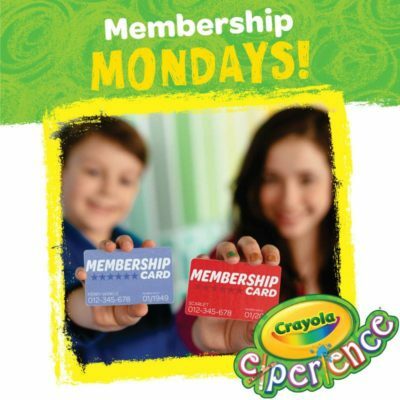 Members to Other Attractions: Got a membership to another museum or attraction? Show your current annual or season pass/membership to receive 50% off general admission every Monday in April. Valid for up to 4 admissions. In southeastern Minnesota there’s a little town called Houston (population 979). It’s home to the International Owl Center, featuring Alice the Great Horned Owl and other owls. Admission is normally $7/adult, $4/child ages 4-17, and free for children 3 and under, so keep that in mind when figuring out which option to purchase. They’re open Fridays through Mondays from 10 am – 4 pm during the fall through spring (I haven’t seen anything on summer hours yet). Shows run daily at 11 am and 2 pm. The City of Houston, Minnesota, is a town full of nature and a community that’s dedicated to preserving it. The town’s nature center provides a source of tourism and environmental education so it became the home of Alice, a permanently injured great horned owl. She was acquired by Karla Bloem, a member of the community that has dedicated her life towards the study of owls after being awarded a fellowship to continue her study on the species. 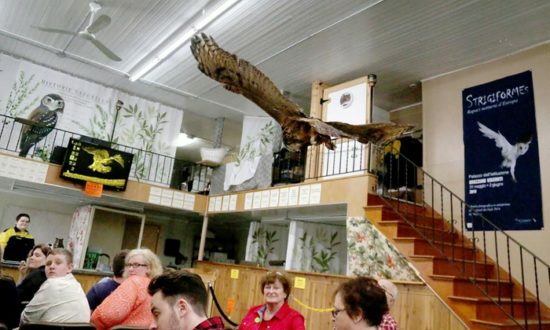 It is through her hard work, her partnership with the town’s nature center, the donations of members and volunteers of the community that the International Owl Center was born. 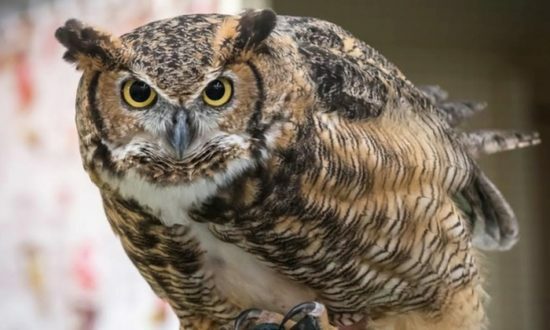 Now, this unique center is home to several owls, dedicated to educating the public about the owls in North America and the world and hosts an annual festival that attracts some of the top name owl biologists from all over the world. With our recent days filled with warmer weather, and the vortex behind us we have to think it’s finally spring here in in MN! 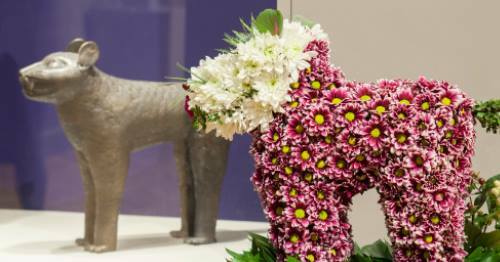 Spring also means it’s time for the annual Art in Bloom at the Minneapolis Institute of Arts. Art in Bloom is a four day festival of fresh floral arrangements inspired by fine art, and it takes place April 11-14. There’ll be tours, lectures, demonstrations, fashion show, a family event and much more. Check out the schedule and more specific information here on their website. For four days the floral arrangements of over 150 designers are displayed next to the artworks that inspired them throughout the museum. Free tours are available every day of the event. Art in Bloom also includes lectures, luncheons, workshops, parties and children’s activities. Some of these require a ticket and include a fee. See our Events page for a full list. Art in Bloom raises funds to support Mia including bus transportation for school children, special exhibitions, art acquisition, education and programs throughout the community. 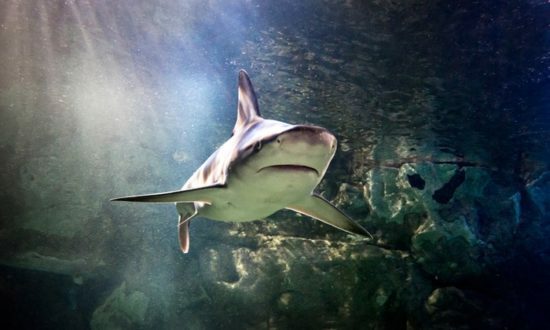 Sea Life Minnesota in the Mall of America is a popular attraction, but it’s also a spendy one! If you’re hoping to make a trip to see the sea turtles and sharks, make sure you save some of your hard-earned cash before heading out the door. 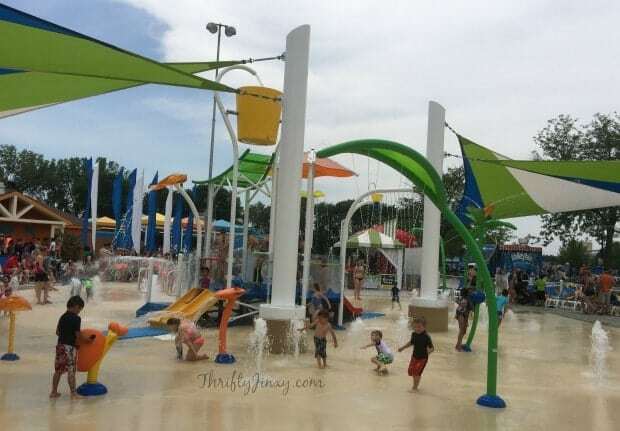 The biggest savings I found on Sea Life Minnesota admission is by using your IKEA Family card which will get you 40% off General Admission tickets. (If you don’t have an IKEA Family card, it’s free to join and you can do so online.) 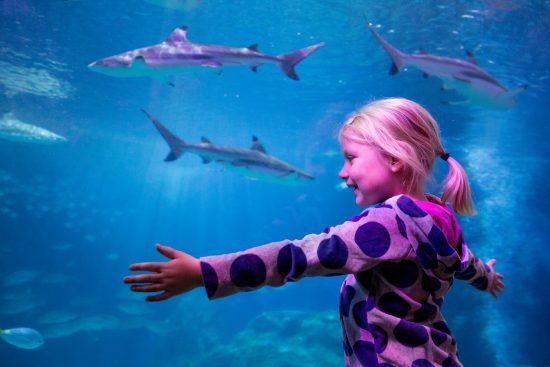 Show your IKEA Family card at Sea Life to receive the offer, or enter the first six digits of your IKEA Family number as the promo code when you order online. This offer is valid clear through the end of 2019! With the discount, I was able to get child tickets (ages 3-12) for as low as $11.39 and adult tickets for as low as $15.59, not including tax (and there’s no fee). Remember that kids 2 and under get in free. But if you’re able to find a coupon for free child admission with adult admission purchase (currently available at Applebee’s and Wendy’s, according to the Sea Life Minnesota website), that would possibly be a better deal than this, depending on how many kids you’re bringing. Register for your child’s free Pre-K Pass online. You will need to register by 6/9/19 to be eligible for this program this year. 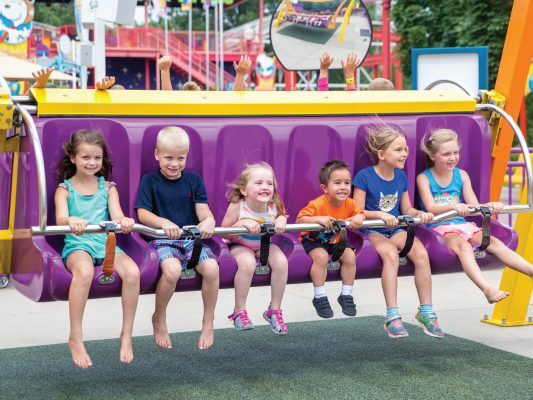 Bring the pass to Valleyfair by 6/28/19 during processing hours along with a valid form of identification that proves the child’s date of birth (birth certificate or travel passport). That’s it! 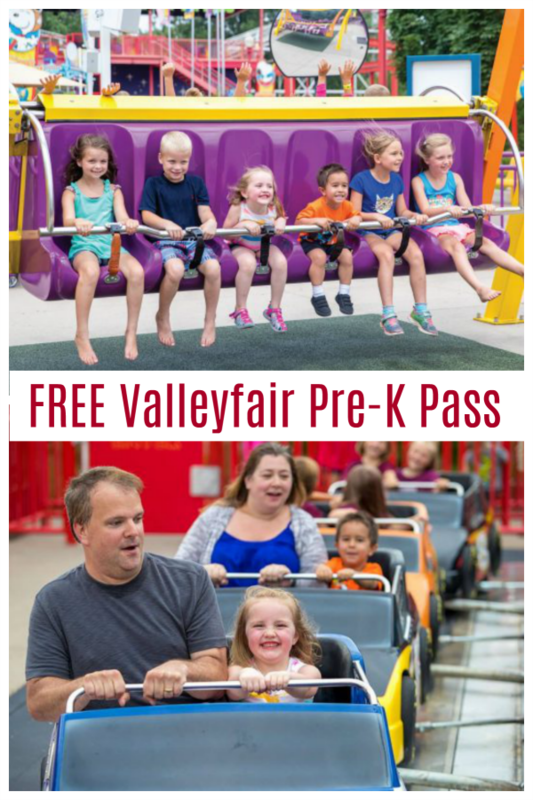 Once validated, your free Pre-K Pass is good clear through 10/27/19 at both Valleyfair and Soak City. For more information and to sign up, visit Valleyfair’s website. 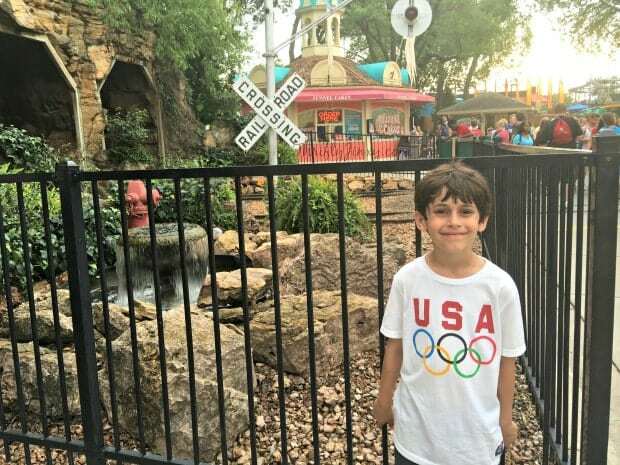 Find discount Valleyfair tickets for the rest of the family HERE. We are lucky to live in an area that offers such a wide array of museums and art galleries! 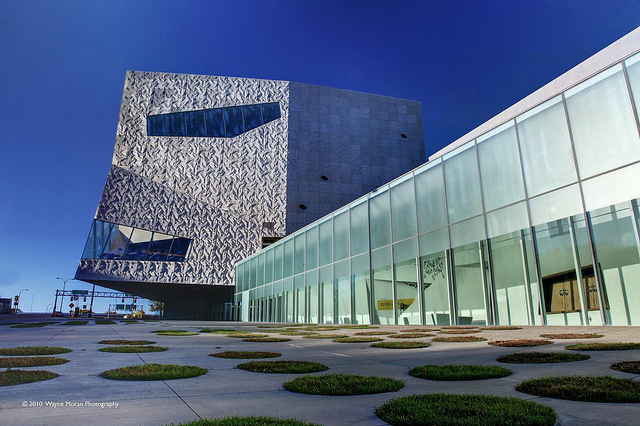 The Walker Art Center is one of many, but it happens to be internationally known. Gallery admission is free from 5 – 9 pm every Thursday night as part of Target Free Thursday Nights. Target Free Thursday Nights are the perfect opportunity to experience the Walker in a new way. 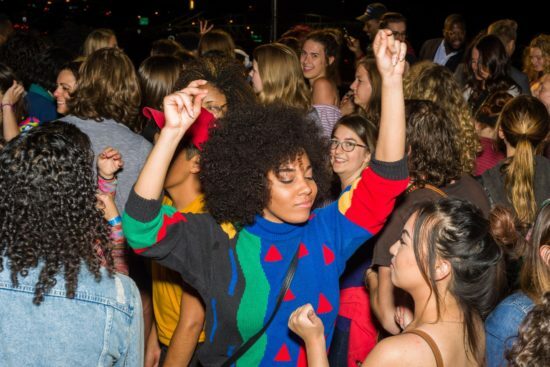 Every Thursday, dive headfirst into contemporary art through an array of free programs: exhibition-related events in the galleries, art-making designed by local artists, lectures, film screenings, performances, and more! If Thursday evenings don’t work for you, more information on their hours and admission rates can be found here. 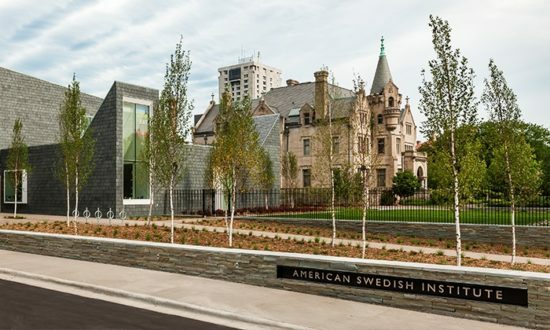 Broaden your family’s horizons with Swedish and Nordic culture at the American Swedish Institute in Minneapolis. 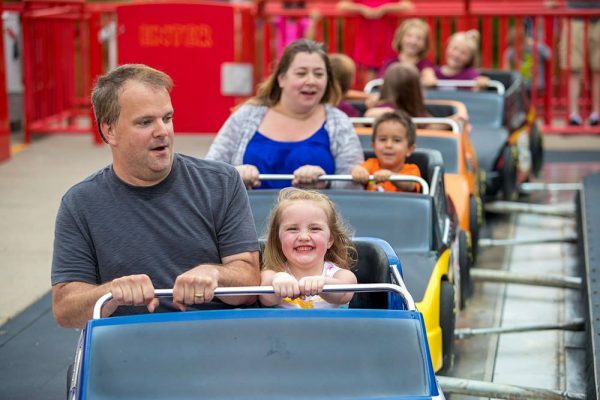 Shop through Groupon and save up to 52% when you buy one admission for $8, two admissions for $14 ($7/person), or four admissions for $23 ($5.75/person). This deal has a limit of 2 per customer. Note that children under 6 and free, and children ages 6-18 as well as full-time students with ID normally get in for $6/person, so keep that in mind as you figure out which option to purchase. Who knew that Minneapolis has a charming historic castle right on Park Avenue? In 1908, Swedish immigrant and newspaper publisher Swan Turnblad constructed a lavish 33-room mansion, complete with rich mahogany woodcarvings by hand-selected artists, imported Swedish porcelain stoves and a stunning stained glass window. In 1929, the Turnblads gave the keys to the castle to the community and laid the groundwork for the museum and cultural center that is now the American Swedish Institute. Today, the mansion, its grounds and the contemporary Nelson Cultural Center, built in 2012, welcome visitors as a gathering place for all people to share experiences around themes of culture, migration, the environment and the arts, informed by enduring links to Sweden. Guides lead regular tours of the historic home and world-class rotating exhibits in the mansion as well as in a modern art gallery, showcasing photographs, paintings and other works of art from Sweden and her Nordic neighbours. 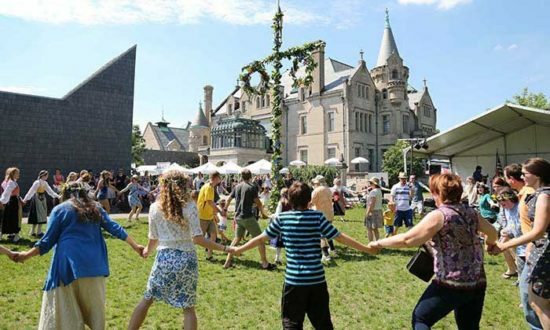 The American Swedish Institute regularly hosts Cocktails at the Castle parties and other performing arts events including an annual Midsommar festival and the famous decorated Jul/holiday rooms. 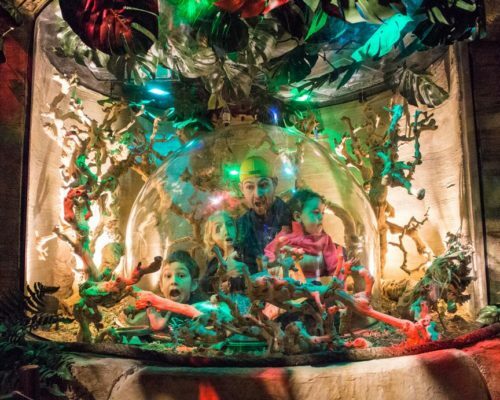 Nordic Table workshops, a family play gallery and educational programs, including Swedish language classes for all levels, offer opportunities for further discovery. To truly get a taste of Swedish culture, take a bite of the seasonal Nordic-inspired cuisine at Fika, the award-winning onsite cafe praised by the New York Times and others. A visit also includes a must-stop at The ASI Museum Store filled with a finely curated selection of goods by Nordic designers, quality Swedish glassware and foot-ware, books, as well as jewelry and textiles by local artists. 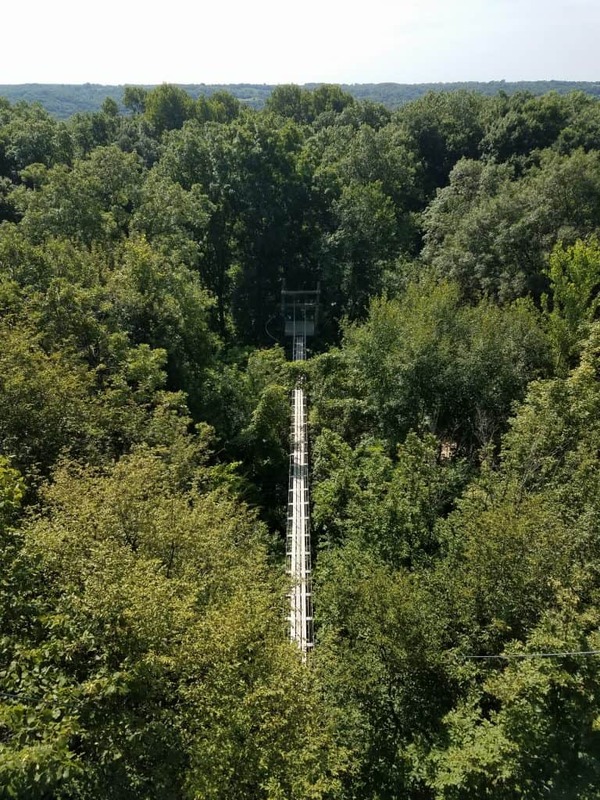 If you’ve been wanting to try Zip lining, we found a great 40% deal for you. 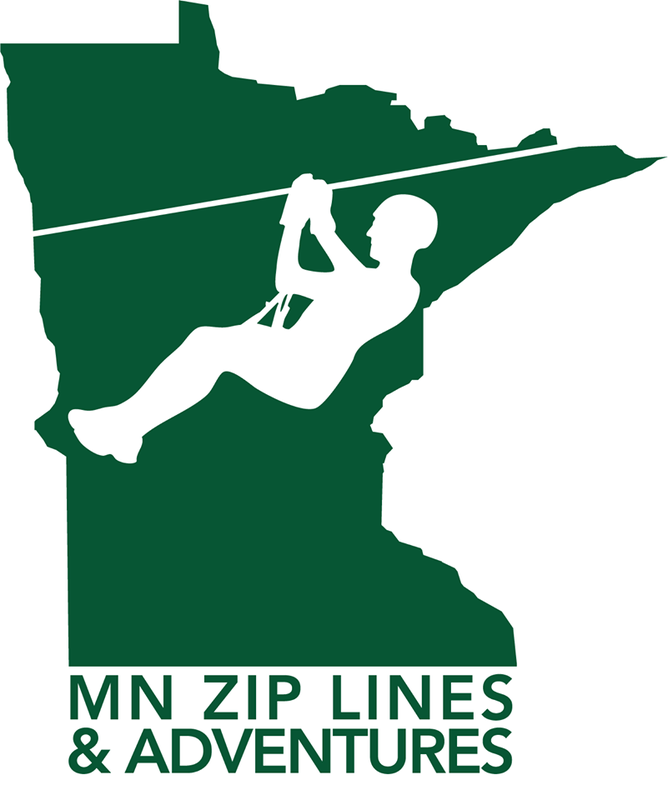 The Earth Day Zip Line 40% Sale is being offered for two different locations in MN. 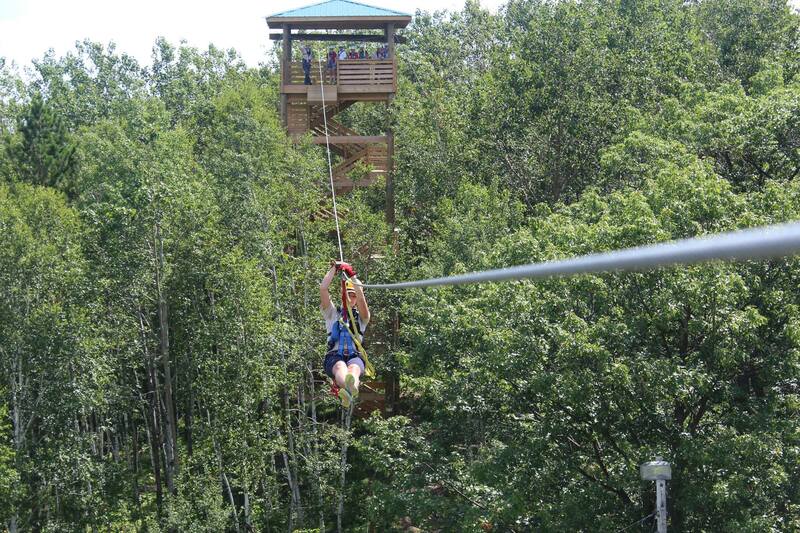 You can choose between the Kerfoot Canopy Tour located near Henderson or the Brainerd Zip Line Tour. You can purchase the 40% off deal between April 1st and April 22nd. **The important part of this deal is that it’s good M-Th between now through October. You will need to book your reservation by April 22nd. So a couple important pieces of information to keep in mind. You can find more information about each location and also purchase this deal on their website here. April 1 through Earth Day 2018 (April 22), book your spring, summer, or fall outdoor zip line adventure at Kerfoot Canopy Tour or Brainerd Zip Line Tour for 40% off. This offer is good for weekday (Monday – Thursday) adventures now through October, but you must book your reservation by April 22nd.